“Incredible”...”Triumphant”..”Out Of This World”.... Star Wars, while it never truly left, is back - and it is absolutely fantastic. "Incredible"..."Triumphant"..."Out Of This World".... A long time ago in a Galaxy far, far away, as movie goers lined up to witness the spectacle of "some new sci-fi flick", these exclamations could be overheard as those now initiated emerged wide-eyed from the theater. A relatively unknown director in an uncharted cinematic experiment had pieced together the aura of countless thematic undertones to introduce a timeless story in the soon to be a global phenomenon called "Star Wars". Dropping the viewer directly into the action as it was unfolding, audible gasps permeated the theater as a dark, masked, pure evil villain - the likes of which had never been seen before - stormed into our collective psyche. It's essence was seemingly already feared and loathed, introduced callously as "Darth Vader" by a striking young princess in white. Vader's tragic story arc unfolded over the course of three films and was later revisited through a critically panned exhibition into his doomed past in a flawed yet passionately produced prequel trilogy. As the universe around Darth Vader grew throughout generations of fans, so to did the legends of the characters and events surrounding him. We are fortunate to be treated to a glimpse of this grandeur within the storytelling mastery of the now Disney-helmed "Rouge One: A Star Wars Story". The plot focuses on the time immediately before the events of Darth Vader's explosive unveiling to popular culture when "The Empire" had its strangle hold firmly grasped on the galaxy. Having developed a super weapon of immeasurable proportions, the power of "the dark side" was on display in the conception and construction of a so-called "Death Star". Rumors swirled of its imminent use for the extinction of rogue planets throughout "The Rebellion" - a rag tag group of ne'er do wells and old republic guardians hell bent on resisting the rise of evil. Enter Jyn Erso (Felicity Jones), a loner and self-proclaimed rebel. Having lost her parents at a young age, Erso echoes the likes of Luke Skywalker - a future legend - always looking to the horizon for something more. When called upon by the rebellion for a secret mission her skepticism turns to passion when she learns her father is alive and responsible for the creation of The Death Star. Through a series of chance meetings, she forms a menagerie of like-minded rogues sensitive to a force none of them can explain. Their mission - to find a weakness in the superstructure by stealing the plans to its construction hidden on a remote island world. Their self-proclaimed call sign - "Rogue...Rogue One". This is the "Star Wars" film that the collective conscious of fans had hoped to receive when George Lucas brought us back to the galaxy far far away with the release of Star Wars: Episode 1 The Phantom Menace in 1999. It's everything Star Wars was, can be, and more. It is a fantastic journey, paying service to the fans while introducing the universe to a new generation of young rebels and hope seekers. The action is pure vintage Star Wars with the spacecraft and war machines of our childhood returning in epic form on the big screen. There are great moments of humor and brotherhood as the Rogue One team defend each other through insurmountable odds and sacrifice all for each other and for the rebellion. Their actions are responsible for the future of the fictional galaxy and our real world nostalgia for the original Star Wars films. It is rare that a film can evoke emotion outside the confines of the theater, yet Rouge One pulls it off and leaves you wanting more. Amazingly, there are seven films already in the canon to watch all over again with renewed wonder and nuance. The final act is a spectacle in itself, a master stroke worthy of recognition, as one of the top action sequences and surprise endings ever produced on film. Finally seeing the pure power and evil of Darth Vader before his redemption links the film to its predecessor seamlessly and will become as timeless and iconic as the struggle of good versus evil itself. The Blu-ray combo pack is enticing, as the picture quality and audio are fantastic. This is the only way the film should be viewed at home. The 1080p High Definition video is spectacular and the special effects remind us of why we fell in love with ILM originally those many years ago. The DTS-HD Master audio 7.1 surrounds you as explosions come at you from every angle and there is no other sound in the world that can send shivers down one's sting than the one of Darth Vader's light Saber coming to life at the end of the movie. The combo pack has over an hour of extras that are bundled together and entitled simply The Stories. Broken into five to eight short segments they touch upon everything from the characters and the actors who portray them as well as the story itself and the special effects used to create Princess Leia and The Governor. Informative and enjoyable, they are well worth one's time. "Incredible"..."Triumphant".."Out Of This World".... Star Wars, while it never truly left, is back - and it is absolutely fantastic. 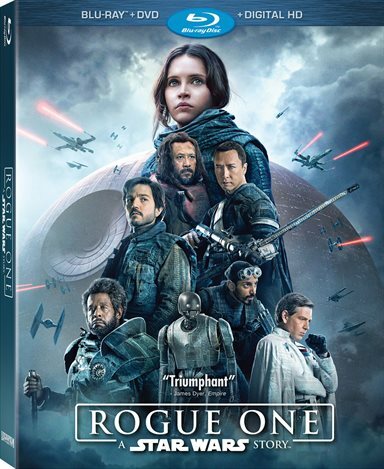 Download Rogue One: A Star Wars Story from the iTunes Store in Digial HD. For more information about Rogue One: A Star Wars Story visit the FlickDirect Movie Database.